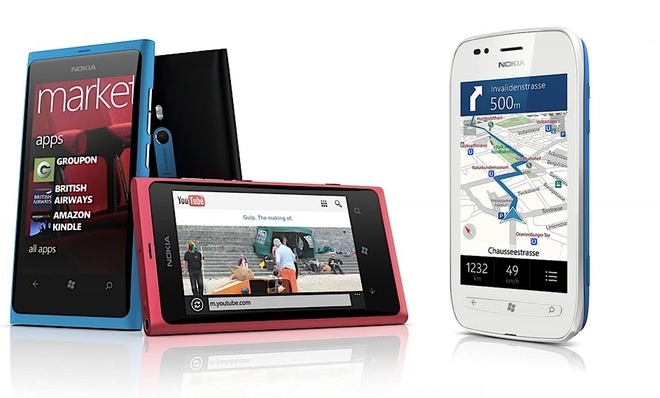 Nokia has announced “the first real Windows Phone” at a special event in London today. The Lumia 800 looks almost identical to the Nokia N9, apart from the fact that it’s running Windows Phone Mango and not the short-lived MeeGo OS. The Finnish company also introduced the second, slightly lower-specced Lumia 710, also running Windows Phone, along with a smattering of Series 40 handsets — dubbed Asha — which are dumb (“feature”) phones pretending to be smartphones. Both the 800 and 710 share a 1.4 GHz Qualcomm chip and a 3.7-inch, 480 x 800 capacitive screen. The 800 has an AMOLED display, whilst the 710 gets by with TFT. The 800 boasts 16 GB storage and an 8 MP camera with Carl Zeiss optics (ƒ2.2), whilst the 710 has a respectable 5 MP camera (ƒ2.4) and 8 GB storage, but only the lower-end 710 has a microSD card slot for expansion. Both have 512 MB RAM. So the handsets are pretty much state-of-the-art for today’s smartphone market, and the prices are also pretty competitive. The 800 is shipping now to stores in the U.K., France, Spain, Germany, Italy and the Netherlands and will cost €420 ($585). The 710 will cost €270 ($376) and ship to Hong Kong, India, Russia, and Taiwan this year. Next year (2012) will see it reaching further abroad, presumably to wash up on U.S shores at some point. The Lumia 800 has the potential to be huge, a throwback to the times of the Nokia 3210 and 3310. And it should certainly please the mass market more than Android handsets, with their inconsistent and ugly UIs, their terrible battery life and their laggy touch response. Good luck, Nokia!